Good Branding is When You Find a Pep Talk Where You Least Expect It. Like On a Halls Cough Drop. I’m currently fighting off a cold, an annoying cough and a low grade fever. And because Theraflu, my elixir of choice, has been temporarily pulled from shelves, I ended up buying a bunch of different meds that I wouldn’t normally purchase on my own: like Halls Cough Drops. 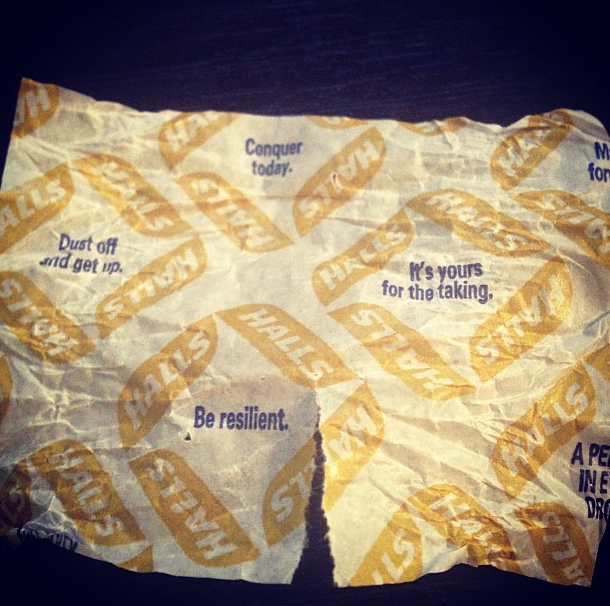 After eating one of the drops I noticed that all of the wrappers had tiny motivational sayings on them and I thought, wow, this is such a smart idea because the number one thing most people need when they’re sick, aside from being well again, is encouragement. And although Halls has been running its “A Pep Talk In Every Drop” campaign for a few years now, this was my first time seeing it. Having the sayings on the cough drops doesn’t change the utility of the product or make you get well faster. But, it does make you feel better about having made the purchase. Halls’ “pep talk” campaign is an example of this quote in motion.